Perhaps the most critical interface in an audio system is that between speaker and amplifier, and there are two important issues to consider. The first is the load presented by the speaker. While most solid-state amps produced today will have no problems with speakers whose nominal impedance is 8 or 4 ohms, tube amps are a different story. Some have output impedances over 1 ohm (and a few are considerably higher than this) and thus mating them with a speaker that dips to 2 ohms or below will often create frequency-response anomalies. The other issue is speaker sensitivity, which gives an idea of how loudly a speaker will be able to play with the amount of power an amplifier can deliver. While most amps that output a true 100Wpc can play loudly with the vast majority of speakers on the market today, amps that deliver fewer than 20Wpc have to be mated with speakers of high enough sensitivity to achieve room-filling sound, if such is the goal. Speaker impedance and sensitivity are even more critical for SET amplifiers, whose low power output and often higher-than-average output impedance can create interface problems. SET aficionados often resort to horn-loaded designs because of their high sensitivity and impedance, while others roll the dice with more conventional designs, often discovering after purchase that a speaker that looked good on paper is not ideal for use with a SET amplifier. 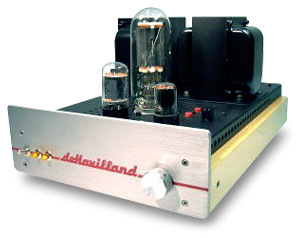 Such is the situation that prompted this follow-up review of the deHavilland Aries 845 mono amplifiers. In our original review, Bill Cowen pointed out that the amplifiers clipped easily when paired with his Coincident Total Eclipse speakers, which we found via our measurements to be 86dB sensitive with a 2.83V input signal, quite a bit lower than the 94dB sensitivity quoted by the manufacturer. Also, deHavilland supplied the amps configured for 4-ohm service, which once again did not ideally match the impedance of Bill's speakers, whose impedance is much higher. We made arrangements with deHavilland to have the amps shipped to me so I could use them with Wilson WATT/Puppy 6 speakers (and subsequently WATT/Puppy 7s too). As we found via our measurements, the WATT/Puppy 6 is 91.5dB sensitive and a rather undramatic 4-ohm load, both of which should, by deHavilland's account, make these speakers more suitable for use with the Aries 845 amps that Bill received. In terms of the amplifiers' sound, I can't disagree with Bill's overall assessment. The Aries 845 is for music lovers who value the middle frequencies more than the extremes. The midrange of the Aries 845 is gorgeous -- expressive, palpable, real. These amps present vocals with the kind of in-the-room presence for which SET amps are famous. They also cast a very believable soundstage that fills the room with well-drawn, vivid images. I find the treble to be slightly subdued and the bass rather soft -- more poofy than pounding for sure -- but no SET amp will give you state-of-the-art bass anyway. The amps certainly seem to be built to high standards, and that big 845 tube never ceases to amaze non-audiophiles, who will ask in automatic fashion, "What the heck is that?" To hear these amps at their very best, put on some small-scale jazz with vocals, like Freddy Cole's Merry Go Round [Telarc CD-83493]. Here Cole sounds more than a little like his famous older brother, aided by the sweet and spacious Telarc sound. The way the Aries 845 brought Cole into my listening room was reminiscent of the way my Lamm ML2 monoblocks handle this CD. It was sooo easy to sit back and be immersed in the performances -- lights out, of course. In terms of Aries 845s' overall output, however, Bill and I had different experiences. Bill noted that the amps clipped rather easily for him, and in an "ugly fashion." During my time with the Aries 845s, the amps didn't clip once, although given Bill's description of the amps when they clip, I wasn't interested in pushing them to discover what happens. I achieved 90dB+ SPLs in my 12' x 24' listening room, and the amps never did anything but make the sort of music I describe above. The Wilson speakers, at 5.5dB more sensitive by our measurements than Bill's Coincident speakers, certainly made a difference in terms of ultimate loudness capability. The amps couldn't drive the Revel Ultima Studio speakers to anywhere near the same levels, and the dynamics were obviously stunted. The Revels are a 4-ohm load, but their claimed sensitivity is 86dB. No doubt these amps need speakers truly over 90dB sensitive, and maybe the 4-ohm impedance of the Wilson speakers has something to do with it too given that the review amps were optimized for such a load. While I can't refute what Bill Cowen says about the sound of these amps, I will emphasize that SET amps have special requirements in terms of partnering speakers, and potential owners should be willing to lug contenders home and hear them with their speakers before buying. Price: $6000 USD per pair; stepped attenuators add $600.